Winter came very late this year in Winnipeg, it wasn't until into December that we got a snowstorm and a foot of snow. A week go the Great-horned Owl finally showed up. The owl has been returning every year in the winter to our property, for many, many years. This year seems very, very slow for winter birds. 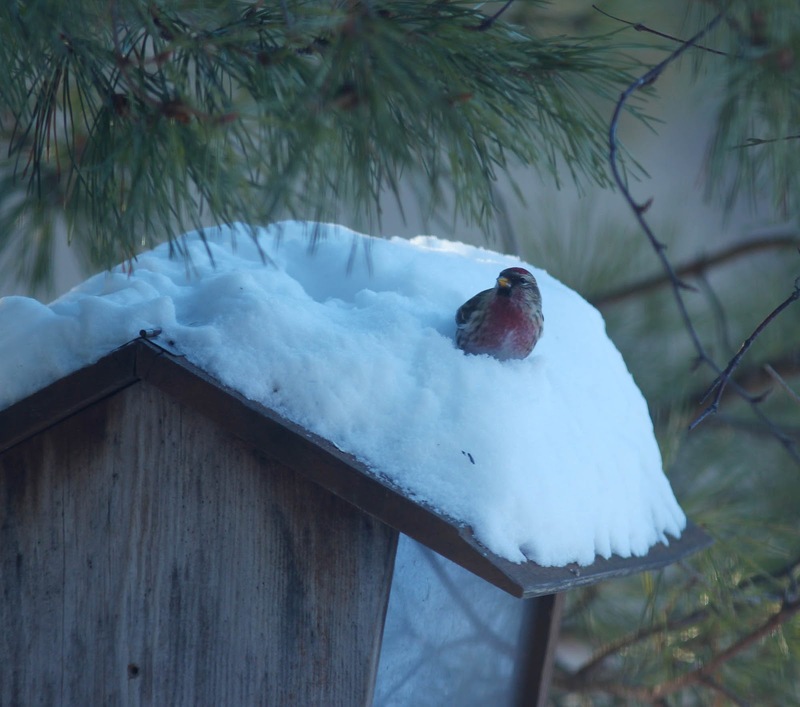 I saw my first winter finch yesterday, a redpoll at the feeder. Since then I had only been seen chickadees, nuthatches and woodpeckers at the feeder. I'm very sorry for my inactivaty recently. For one I've been quite busy with school and other things, and around the yard bird activity has been very slow. The Great-horned Owl has returned to our yard though, as it does every winter. 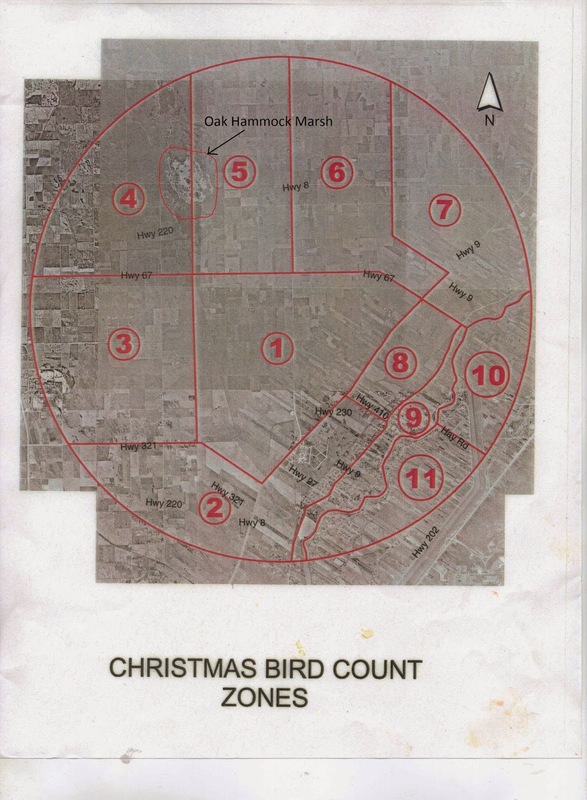 For now, here is a post about the 2016 Oak Hammock Marsh Christmas Bird Count. There are no great photos in this post, because we were birding from the vehicle most of the time, and photography was not the purpose. Bird life seemed very low this CBC, and we had trouble finding many different species. Chickadees, ravens and Blue Jays were the most common, and anything besides that was a treat. We were assigned zone 2, and set off. We covered the Western part of the zone fairly quickly as there were few roads, and very few birds. There were five Grey Partridges on a driveway, the first exciting birds! It took a minute to figure out what this little bird hiding under a feeder was. It's a female House Sparrow, another species onto the list. We spent more time on the Eastern part of our zone driving in and out, through and among the little residential roads, mostly looking out for feeders that might host some bird species. There was a little mark on the map showing a house with feeders. We visited it and found out why someone had marked it on there. There were tonnes and tonnes of feeders! Not as many birds as feeders unfortunately, however we did see some more chickadees, blue jays, White-breasted Nuthatch, and added a Downy Woodpecker to the list. We were sitting at 9 species and we were getting to head back to the Interpretive Center because the results and a hot lunch was there for 12:00. I was just saying how it would be nice to see one final exciting bird, and how that somehow seems to happen often when we're birding. Just as we were on the last road to exit our zone, I saw something sitting on a pole, which was not a raven. From a distance I tried to figure out whether it was a Owl or a hawk. When we got closer I could see that it was a Rough-legged Hawk, and we were able to get close enough for some half decent photos. It was quite a treat to see at the end. And with that we headed back to the building and the results were tallied. We had 10 species and I believe about 64 individual birds. The team with the highest species count was 15 species. After a tasty lunch the 'Best Bird' was voted as a Gyrfalcon, and the prizes were handed out. There was also a Rusty Blackbird seen, which would have been the runner up. Afterwards we, and several other birders, went to try and see the Gyrfalcon, which is very uncommon. We saw this Rough-legged Hawk in a tree, which I was fairly sure was a Gyrfalcon, because it was where a team described it to be. The bird was across a field against the sun, so the photos were bad and you couldn't tell what it was. There was a while of humming and hawing until it flew and we could see it was a Rough-legged. And here is a bad photo of some Grey Partridges on the snow. Here I come to a close my friends, for that day of fun birding had come to an end. I must say, it was thoroughly pleasurable and I am certainly looking forward to next years CBC and any future birding excursions. I'm very sorry for my inactivity recently but finally here is a post. About a month ago we went birding with Christian Artuso about an hour north of Winnipeg along the beaches of Lake Winnipeg. We started north at Victoria Beach and slowly worked our way south from there. We walked along the stony shore, armed with two cameras, a spotting scope and binoculars. There were a fair number of Lapland Longspurs and we got some fantastic views of them. And of course... gulls. There wasn't anything particularly exciting in the gull department, Ring-billed, Herring, and Bonaparte's mostly, along with some Caspian, Common and Forster's Terns. It was a little bit odd to see a Savannah Sparrow out along the shore. There was also a good number of American Pipits, though they were more skittish than the Longpurs, so photos were harder. We also found this beautiful Pectoral Sandpiper, foraging among the pebbles. And our fabulous guide and friend, Christian! The changing colours of fall made for some very pretty landscapes. Here are quite a few non-bird photos, if you don't mind. Among the rocky shore here there was a flock of American Pipits. Far out on a group of rocks in the water we saw a Bald Eagle, and we eventually meandered far enough to be in photo distance. This was quite an interesting tree, it had basically grown into a rock. Well, that's all folks! I might still post a few photos from the trip, but there aren't many more bird pictures. All in all it was very fun and successful, and a huge thank you to Christian for taking us!